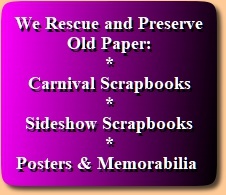 This page is here to help you build a carnival and sideshow history library of your own and to assist with research. Click Books By Category to see the books relisted in eleven subtopics. Click Book Covers to see the cover images. See our Recommended Reading page for a more selective guide to the most essential works on the history of carnivals and sideshows.